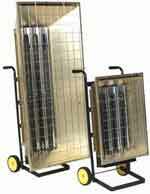 Commercial & Industrial Space Heaters. In a larger workplace such as a stock house or factory, and even in smaller facilities, one of the biggest problems that face employers is installing a cost effective heating system that adequately balances the needs of employees with the financial and environmental concerns of energy usage in the workplace. In many workplaces, the best answer to the question of providing cost effective heating that is easy to use and reliable is to install a number of industrial space heaters throughout the facility that can offer either direct or indirect heating onto a large area at one time. The idea behind a commercial space heater is simple. A large reflective dish with a heating element in it is positioned either on the floor or in is suspended from the ceiling. This is then switched on, and thanks to the design of the reflective part of the device is able to direct heat into the area where it is required. Wasted heat is minimized, and the heating system is generally efficient and effective enough to only be used occasionally throughout the day. Under most circumstances, floor mounted heaters can simply be placed in the area required, and plugged into a regular power supply. They are able to generate plenty of heat and because they point the heat in a single direction, they minimize wastage. Roof mounted heaters require a little more effort in their initial installation thanks to the fact that they must be professionally hung. Despite this, thanks to the fact that they only need an electricity supply, rather than connection to water heating system or an air conditioning network, little additional work is needed. The second major advantage of industrial space heaters over alternative means of heating is their reliability. They are amongst the simplest possible heating devices available. Essentially just a larger version of a typical domestic electric fire, the design is minimalist, and comprises of a heating element and a reflector. This elegance in design ensures that there is very little that can go wrong, and in most cases, once a commercial space heater has been installed in a workplace it will remain in service for many years with only minor maintenance checks being carried out to ensure constant efficiency. The third major reason for using industrial space heaters to warm a working area rather than any of the alternatives is the fact that they are so effective. Thanks to the high power output in that ranges from 1.5 up to 13.5 KW depending on the voltage, these heaters can boost temperature in a particular area in a matter of minutes and change it from being uncomfortable to being very pleasant quickly. This means that staff can get started with their work a lot quicker and in turn boosts productivity without any major investment of time or effort beyond the initial installation of the equipment. Reliability, simplicity, and effectiveness in use make industrial space heaters one of the most elegant and usable tools to make a work place more pleasant for staff and more productive throughout the year. As you continue to read through our selection of Industrial space heaters, keep in mind we stand ready to answer any questions you may have about our offerings. Call us at 1-888-776-3720 whenever such questions arise and let us help you make the best investment within your budget. We are located in Houston, Texas.